Algebra Teachers: Supplement Your Algebra Curriculum with Lessons Guaranteed to Help Your Students Succeed! is exhausted and tired from spending endless hours creating your own Algebra lessons? has trouble finding examples and homework problems to supplement your curriculum? could use a sequential set of video tutorials to supplement your one-on-one tutoring program? My name is Karin Hutchinson, and hopefully you've had a chance to peruse Algebra-class.com. I am the sole creator of this site, and my ultimate goal is to help ALL students find success with Algebra. You know that feeling - it's that "Aha" moment that makes teaching so rewarding! I realized as soon as I started tutoring (which was in a completely different school district than where I taught), that students were struggling because they were missing a solid math foundation. As teachers, we all know that students must have that solid foundation that builds year after year. Those who don't have the foundation, struggle year after year. As I helped my students go back and build that foundation, their grades improved, as well as their love for math! And.... I learned something else! A lot of my students struggles was with the order in which topics were being taught. One week they were working on solving equations and the next week something completely different, like probability. They never had a chance to continue building on that foundation, as they jumped around from concept to concept. I know that some schools call this "spiraling", but it's not a method that I endorse. If feel that this is where we are creating gaps in our students' learning. When I decided to sit down and tackle my own Algebra curriculum, I knew that I had to create a curriculum that builds a solid foundation for our students. Algebra Class does just that! Each unit is studied extensively before moving on to the next unit. And... even better, each unit builds on the previous unit. So, as students leave Algebra 1, they have a strong, solid foundation of Algebra skills! How Can You Use Algebra Class? If you teach in a district that does not have a solid curriculum, you can use this curriculum from beginning to end and your students will have completed an entire year of Algebra 1! This curriculum includes everything you will need, including video tutorials, notes worksheets, practice problems, step by step answer keys, formative assessments, quizzes, unit tests, a mid-term, and final exam. If you have a set curriculum, then you can supplement your curriculum with the materials in Algebra Class. The video tutorials may give you other ideas for how to each a concept, or they can be used for individual study. The worksheets are available for classwork or homework purposes, and the quizzes and tests are available for additional assessment information. Algebra Class is a great addition to any Algebra curriculum! 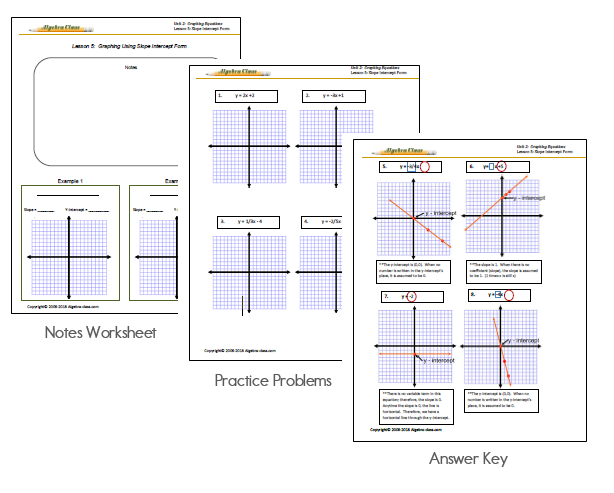 Teach your students how to solve any linear equation in one variable using my unique, step-by-step "Solving Equations Organizer"
Special strategies on how to "break apart" word problems so that you can write an equation and solve the problem with no frustrations! Video tutorials that can be used with the whole class or with individual students. This is also great for the "flipped classroom" approach. Practice worksheets for every lesson that can be used for classwork or homework assignments. Just think... no more spending time creating worksheets for homework! A LOT of real world problems that are authentic and meaningful to students. These problems will challenge students to think critically and apply their knowledge! Quizzes, tests, mid-term, and final exam that can be used to ensure that students are building a strong foundation! A step by step answer key that allows to you quickly check students' work. Easy access to all lessons. They are categorized by unit, so you be able to quickly find the lesson you are teaching. How Does The Online Algebra Class Work For Students? Students will start by watching a video lesson. Each video explains the concept in "bite size pieces". Through several examples, they are guided step by step through the process. Students are also given a pre-designed "notes worksheet" to take notes on as they watch the video. In this way, they will have notes to refer back to when completing their practice problems. Students will then have ample practice problems to complete in order to fully master each skill. Each set of practice problems ends with a small formative assessment to make sure that they've mastered the skill. The BEST part is that you will have step-by-step solutions to every single problem! You will never have to spend time trying to figure out where your students made their mistake. So... What Units Are Included in This Algebra Program? I know you are wondering if this program will cover the units that you are teaching. If you are using this as a supplement to your curriculum, you will find many individual lessons guaranteed to suit your needs. If you are like me, I don't like to buy anything unless I give it a try first. I like to see what it is all about before I invest time or money into it. So, I'm going to give you a FREE TRIAL! You will get the first 2 units FREE! This way, you can try it out, see if it works for you and make sure my videos don't put you to sleep! And... you don't even have to enter your credit card! That's my biggest pet peeve. If you want to try it out, I want you to try it with no strings attached! I know other sites charge hundreds and hundreds of dollars for their full curriculum and resources; however, I know first hand that you are probably purchasing this with your own money and I want you to be able to afford the resources you need to help students learn! I simply love your work! I teach Algebra I, Algebra 2, and Geometry at a charter school in California for at-risk youth. I have small classes of twelve, which is very helpful with this population. I stumbled across your site when I was desperately looking for curriculum to use in my classroom. Our company got rid of its math books and had some relatively new, inexperienced, and ambitious teachers get together in June 2015 and write the math curriculum for all the subjects I teach. It's horrible, but it's all we have available to use now. I paid the membership fee out of my own pocket to get your lessons and worksheets on Algebra I and Algebra 2 (when do you think the complete course will be done? Lol!). Your work is a breath of fresh air and makes so much sense in the order of topics covered and the specific concepts taught. (In our new curriculum, the authors have us teach quadratic equations before learning about polynomials. It makes no sense to me. I love your videos (I plan to play them and walk the room to make sure students are always on task). I love your worksheets...you evidently put a lot of thought into the different types of problems the students need to know and also the types that might be a little tricky for them. I feel such a sense of relief, knowing that I don't have to rely on our school's "homemade" curriculum. I have been watching every video and taking the notes, as if I were a student. I am logging down the length of each video in order to make sure I have plenty of time during the class period to play all of them. I can't help gushing about the tremendous quality of your work...it is a godsend to me. I can't wait to try it out! Thank You! It's been a week since my purchase and I am absolutely thrilled with your material. The word problems are fantastic. I used some of your compound inequality word problems in class and presented them on the whiteboard. I showed the content with the other two eighth grade math teachers and each of them in turn purchased your materials. What a great bargain!!! Thanks again for your hard work. Everything is organized beautifully. Save yourself time and energy and get your Algebra materials today! I wish you much success in your teaching career.